Wirksworth holds its annual custom of Clipping the Church on the Sunday nearest to the 8th of September. 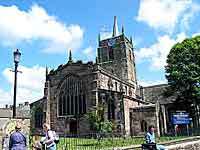 It involves surrounding the ancient Church, which is dedicated to St Mary the Virgin, by holding hands. The custom was revived in 1921 after a lapse of many years, and it is supposed to be an outward display of affection by the parishioners, for their church. Its origins are unknown. After a morning service the vicar and choir start a circuit of the building, with the churchgoers following, holding hands, forming a complete ring whilst singing `We love thy place O Lord in which Thine honour dwells`. Sometimes there is a procession through the town, joined by church dignitaries. A similar custom takes place at Burbage Parish Church, near Buxton, on the last Sunday in July.